Family class sponsorship is common in Canada. Although most cases are different, the federal policies allow any ministry to take advantage of the re-victimized sponsors illegally. Two hypothetical cases below can illustrate this social problem. Celine Doe immigrated to Canada in 1990. One day she met Fred, a handsome man, in one of the ex-colonies. He was a prince, the son of a tribal chief. He spoke both English and French quite well. Celine thought that he could become an asset to Canada and to her. Fred promised to marry her (but he never did). She sponsored Fred who arrived in Canada in 1993 as a landed immigrant, with his daughters. Soon he changed and started to abuse her within a few weeks, than left their home. She was left with Fred’s two daughters that were 17 years old and two months old. Celine took good care of the girls, educated them, spending all of her money on them. Once she got a phone call from Fred. He was studying at a university for he wanted to become a judge. He said he had little money. In reality, Fred applied for social benefits in 1993. He reported to the administrators that his wife had abused him. When they asked for details, he lied, “She told me that she hated me because my skin was too dark.” He also told a lie that his two daughters were living with him and he was supporting them. The chief administrator pacified him by stating, “You are now in a democratic country where no one can discriminate against you because of your race or ethnicity. We guarantee that you can study and choose a good profession.” So the office granted him social benefits and sent him to the university. Celine did not suspect anything, for no government official has contacted or phoned her. Fred kept moving from province to province and applied for – and received – social benefits everywhere during a decade. Many years have passed. Celine realized that she was waiting for the return of her beloved Fred in vain. Fred’s older daughter – Maria – was a good worker, working non-stop from 1993 to 1998. Then Maria had an accident in the factory and lost her right hand. Celine had to hire a lawyer but they lost the case against the company. In 2008 Celine tried to sponsor an old friend from Europe who was interested in marrying her. The federal government was silent. They could not decide in her sponsorship case. Then she received a letter stating that they were investigating her debt; she could not sponsor her new man. Even his visitors’ visa was refused. The oppressed but shy and frail Celine tried to file a statement of claim at the courts for a solution. The provincial court sent her to the federal court while the federal court sent her to the provincial court, both qualifying her as a vexatious litigant. Also, she was obliged to support the lazy younger girl who would turn 25 years old only in 2018. Celine’s tax account has always been garnisheed. She wanted to visit her fiancée but she could not afford it. She had no free time, working day and night for nothing, for the errors of the administrators. Then a top manager of Service Canada sent her a letter which said that her future pension benefits may be garnisheed without any procedure at the courts. Celine’s lawyer explained to her that the word “may” in the ministries means that her pension benefits shall be reduced, perhaps to zero. He showed Celine the Canada (Attorney General) v. Mavi, 2011 case as a rule for this. Celine would be better off in any country outside Canada, as a political refugee. Here she could only commit suicide, or turn into terrorist by burning down the nearest government office to ashes. Or, she could start a public hunger strike and notify the international media that may help her, or even handcuff her wrist and ankles to the steel fence of Parliament Building on Canada Day when it is not freezing in the night. She cannot expect any help from the champions of red tape. Rick and Jane lived in the Northwest Territories. They had a corner store and did a lot of volunteer community work. Everybody loved them. A few decades ago, when tsunami and hunger struck a third world country, they decided to sponsor a six months old orphan from there. They loved the baby boy, Josh, and took good care of him. A year later, the baby was kidnapped by a criminal whom the local police could not locate. When Rick and Jane were unable to pay, the province started to harass and threaten them. Due to the continuous stress, pressure and the lost court cases they gradually became depressed, aggressive, hating every human being, even each other. They blamed each other for sponsoring Josh. They separated and chose early retirement, for they were unable to concentrate at work. It became worse when 75% of their pension benefits were garnisheed by the province without any legal procedure. Luckily, they found a good lawyer who advised them to get certificates from the doctors about their depressions and disability to work. He advised them to move to the warmer BC, since they had no monies left to heat two cottages. Finally, they won a court case in which the Judge ordered that the Province and Canada shall jointly cover the medical expenses of both, in separate rooms, in a nursing home of Vancouver. This way, both the province and the state lost large amounts continuously and unnecessarily, for disobeying the law. But, by turning two loyal and hard-working persons into enemies and burdens of the society, every party involved became a great loser, except the lawyer. Was this the intention of Parliament? These test cases were submitted recently to the Supreme Court of Canada in an appeal. They have been ignored. The writer married abroad in 2006. Since then, Canada’s red tape refused to give any kind of visa to his sponsored wife and stepson. Such flagrant violation of human rights, by unlawful separation of the families, does exist in Canada. The courts of Germany could not stop the prosecution of the Jews, and – if the important issues cannot reach a panel of five judges – the Supreme Court of Canada may be unable to stop the prosecution of the re-victimized sponsors. Here the sponsors are victims of a federal tort that was masterminded by the CIC and completed by the CRA. There is no indication that the provinces are guilty by accepting gifts due to a federal abuse of power. Note: CIC is the [Ministry of] Citizenship and Immigration Canada while CRA is the Canada Revenue Agency. CIC is the [Ministry of] Citizenship and Immigration Canada while CRA is the Canada Revenue Agency. The author of these web pages, Zoltan Andrew Simon, married in China in 2006. There is a "debt claim" against his since 2000 when British Columbia unnecessarily paid social benefits to a woman sponsored by him earlier. The ministries were silent for almost eight years. He has evidence that he had never been notified before his garnishment. B.C. 's claim has never been registered at the Federal Court, and no ministerial certificate has even been issued. He is not a debtor. 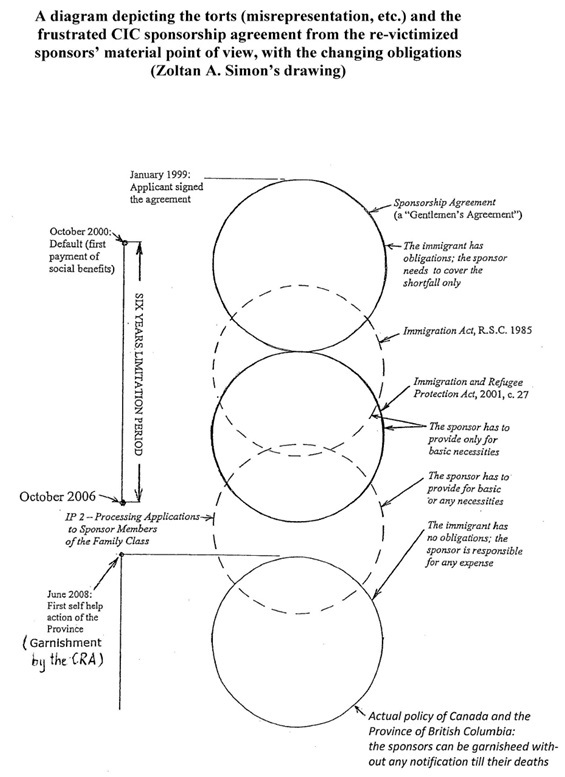 Despite of these facts, Canada forbids the unification of his family by all illegal means. His wife applied for Canadian visitors visa twice but it has been refused. During seven court cases, eleven federal judges could not (or rather, were not allowed) to give him any answer, reason, or solution. Therefore, the author is now considering to give up his valuable Canadian citizenship as a public protest against Canada's inhuman, illegal, and unconstitutional policies. He is considering to apply for citizenship in a free and democratic country as a Canadian political refugee. If you are a lawyer, judge, politician, or a person interested in the relevant legislation and common law (case law precedents), please refer to a complete law paper under our section entitled THE SILENT JUDGES.